For the past two decades, Capcom has been the king of the fighting game world, but its titles have never featured engrossing stories. That may be changing in the near future. 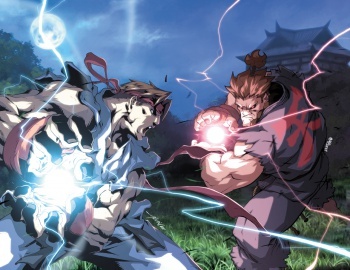 In a new post to the Capcom Unity forums, Capcom senior vice president Christian Svensson reveals a call from the company's marketing wing for more focus on singleplayer content in the firm's traditionally multiplayer-focused fighting games. "The strategic marketing group here has for quite a while been pushing for our fighting franchises to have more and better single player content, of which full fledged story modes are one component," Svensson writes. "How and when those requirements manifest in our future roadmap, I'm not prepared to speak about at this time." So while the Capcom status quo may not change immediately, it is something that's in the works, and with good reason. While Street Fighter 2 (and its innumerable off-shoots) could get away with two or three screens of end-game story content for each character, modern fighters have come a long way in their ability to tell a cohesive story. Granted, rarely are these stories of any quality, but at least they exist. NetherRealm Studios' efforts are a great example of this. 2011's Mortal Kombat featured an hours-long story mode comprised of cinematics which retold the story of the first three Mortal Kombat tournaments. This story mode was pocked with fights which tied into the ongoing story, cleverly combining the game's core gameplay with its ability to weave a cohesive narrative. NetherRealm's next project, Injustice: Gods Among Us features an even more fleshed-out storyline, complemented by a surprisingly not terrible DC Comics-published comic book. By contrast, Capcom's most recent high-profile fighters are still relying on minor, post-battle screens (most of which are static or barely-animated illustrations overlaid by short text blurbs) to fill in the backstory for each of their characters. Despite having years of interesting (if confusing) lore to delve into, it's always felt as if Capcom focuses primarily on multiplayer fisticuffs and only throws in singleplayer stuff as an afterthought. Here's hoping the call from Capcom's marketing wing leads to more full-featured fighters in the near future.